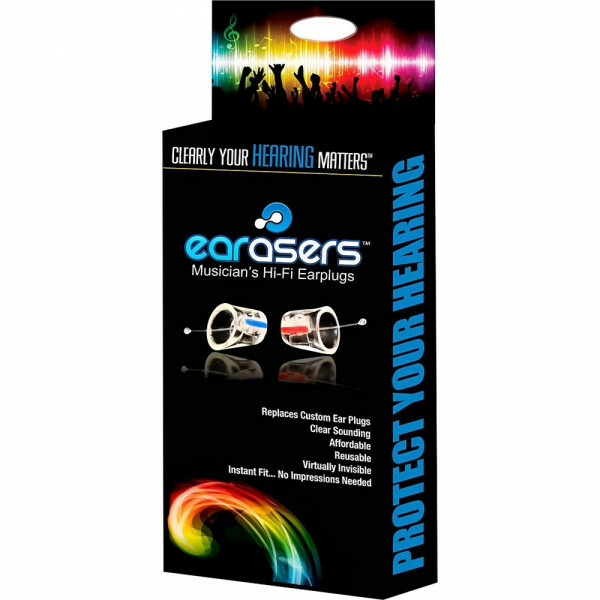 Whether you are a musician, attend concerts or are regularly exposed to music played at high levels, Earasers don’t plug up your ears and muffle sound like more conventional earplugs. Manufactured by a 45+ year hearing aid company, and developed by their lead engineer - a musician for over 20 years - Earasers filter out loud noise while still allowing you to hear at a safe, comfortable level. Musicians have to be able to focus on the different layers of instrumentation. Earasers utilize a unique attenuation “V filter” to provide up to 19dB of protection in the frequencies you need it most. The result is the world’s first flat frequency response earplugs. Research suggests that 85-90% of the general population do well with SMALL and MEDIUM, with a very few who do well with LARGE. SMALL - tends to work well with the majority of Women, Younger Males, and some Men who prefer a farther-in-the-ear canal fit. MEDIUM - tends to work well with Adult Males who prefer not-so-far-in-the-ear canal fit. Weiterführende Links zu "Earasers Hi-Fi Earplugs"
Kundenbewertungen für "Earasers Hi-Fi Earplugs"